Sunday Sweets is my weekly NON-Wreck feature, the better to show how wrecky the Wrecks are. Here's the perfect board game to celebrate an 80th birthday: LIFE! The most impressive part of this cake, though, is the young lady who made it. Melia is sixteen, and makes cakes as often as friends and family will let her. So check out her site here, and take heart that the future of cake art seems to be in good hands. 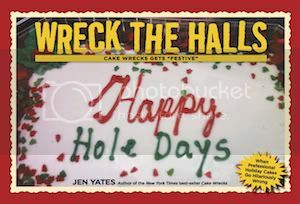 I don't know about you guys, but I'm getting a real nostalgia jolt from some of these cakes over here. Remember Operation? For those of you who don't know, the game's called Carcassonne, and John G. digs it. I played it once, but I'm definitely more of a Pictionary kind of girl. At any rate, this sweet cake is our Fondant-Free Sweet of the week. Bron (the baker) also reports that it took two months to make all those pieces out of sugarpaste. Yowza. You know me: I'm lovin' all those colors. The side texture is gorgeous, too. That's it for now! If you have a classic game cake (or any other amazing cake design) you'd like to share, just send it to me at Sunday Sweets [at] Cake Wrecks [dot] com. Or, if you have an idea for the world's best Geek cake, submit it here for the chance to see your design brought to life by Melissa of Wild Cakes. I'll be helping Melissa & the Great White Snark himself choose the winning entry, and the resulting cake will be featured here and on GWS. So get your geeky creative juices flowing, and enter as many different ideas as you like. Whoa! those are some pretty epic cakes there :D I'd love to have one of those sometime! The harry potter cake was truly an epic accomplishment in cake making! I would LOVE to see a Mouse Trap cake! I'm lovin the Life cake too. Awesome throwback cakes! What a walk down memory lane. And Melia, bless you child! You've renewed our faith in the next cake-making generation! SHE has a Hungry Hungry Hippos cake, too! I want a chess set that looks like that last one. I love Carcassonne! Those cakes are really well done! Never a huge fan of operation, but I am definitely a fan of the LIFE SIZE version of the game. 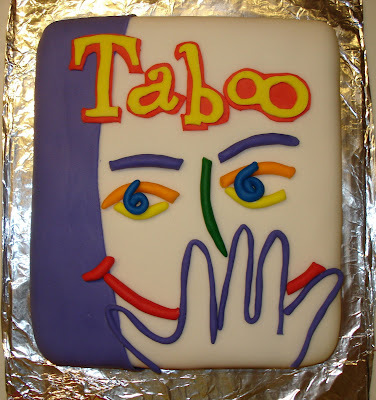 The taboo cake is absolutely perfect! I did find a hungry hippo cake made by the same girl who made the Taboo cake. Here. The link to Melia's website has a Hungry Hungry Hippo cake! The Operation cake was also made by Charm City Cakes. Theirs worked! They had it fixed with batteries, so you could actually play the game. That was on their TV show. 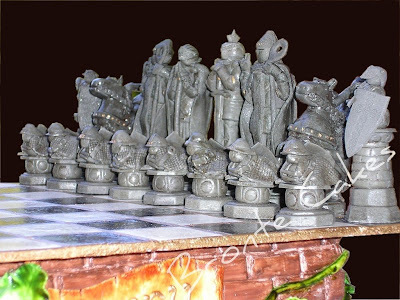 The first chess set is the "wizards chess" set from "Harry Potter and the Philosopher's Stone" and it looks fantastic. Man I love cakes...and Harry Potter. Am I the only one who cringes when she watches Ace of Cakes? Those guys all play with their hair, their faces, then work on the cakes...last week they showed a sculpture part fall over onto the floor and they just cleaned it up! Yikes! These are awesome. I love the LIFE and Operation ones the best I think. The Harry potter chess is pretty sweet too. Those are GREAT and Melia that is just wonderful keep up the good work!! I was about to link to Melia's hungry hippo cake too, but it seems that's been taken care of. However, I thought you might like her royal flush cake here! 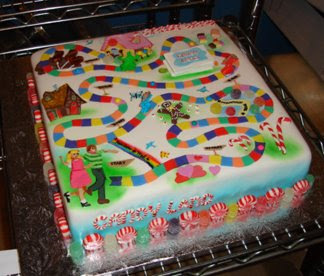 Oh my god, I want that Candyland cake. Also, I would love to see a Clue cake done up right by one of these masters of confections. 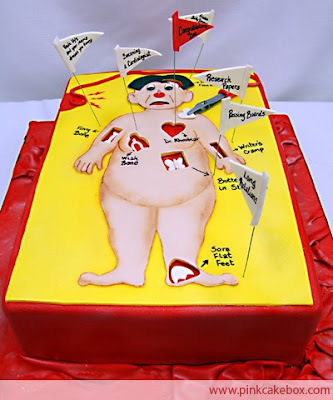 As good as it is, I'm disappointed in the Operation cake. There were multiple ailments missing, including "Water on the Knee". And Melia: You Rock, kiddo!!! Keep up the good work, and you'll be giving the Ace of Cakes a run for his/their money. Ha! It's funny but my 11 year old son keeps asking for an Operation game. He would keep that cake and PLAY it instead of EAT it. Looking closely at the photo, it looks like there's a tiny lightbulb in the nose! How cool is that? 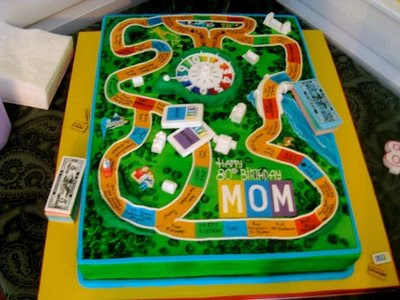 The game of LIFE is a really cute idea and so is a Candy Land cake. That would be great, to have an edible Candy Land game! The chess sets look far too nice to eat. Those are truly wonderful cakes! I think my personal favorite might be the Operation cake, but it was really, really hard to choose today! Screwball Scramble cake, with working ball bearing traps. I always lost at the game of life. I'd like to see a Monopoly cake —what I consider the most popular board game ever! Think of making all those houses and hotels of molded sugar. MMMM ... I'd like to buy four houses for Boardwalk, please. Someone needs to tell Melia to stop using that foil on the cake boards. It really takes away from the cakes! Oh my goodness, and did you see the 17 yo's Robot Cupcake Cake? I HATE cupcake cakes, and I think it's about the cutest thing I've ever seen. I was decorating cakes professionally at that age (strictly Wilton method, thank you, in 1978) but I never had anything near that much talent or creativity. Fantastic! They are all terrific, but I really like the Operation cake. Note: Not only does Melia have a hungry hungry hippo cake, she has an awesome royal flush poker cake. Or Cakes I guess since its five flavors. I'm just sad there was no Risk cake. I want a Chutes & Ladders cake. These cakes are awesome! Fun! charm city cakes (aka that ace of cakes guy) has a scrabble cake. The cakes are beautiful and amazing but the hygiene (or lack thereof) bothers me too. I'm not sure I've ever left a comment on your blog before...but I had to say that I love that you found a Carcasonne cake! I've never known anyone that's played that game except my husband's family, and it's hands-down their favorite. I'll have to make sure to show him the cake! 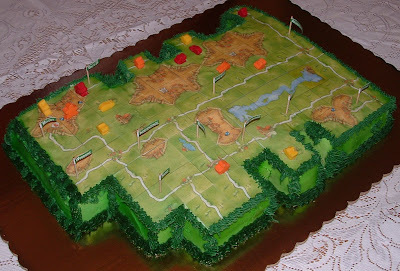 All the cakes are awesome, but that Carcassonne cake!!! Let's see, one of the best games ever, fondant free, and really well done with lots of detail. WOW!! Does anyone know anything about how the tiles were done on the Carcasonne cake? I'm really curious because I've never seen anything like it before. Awesome! One of my cakes was picked! The Melia cake site has a Hungry Hippo cake about 20 cakes into it. Talented little booger she is. All my cake attempts could make up their own cakewrecks site. Sigh. I have witnesses to vouch for me. The Wizard Chess cake is just...WOW! Melia is amazing! I'm bookmarking her site. I can't wait to see what she does next. Just FYI. There is a Hungry Hungry Hippo cake on a website you posted about in your last post. 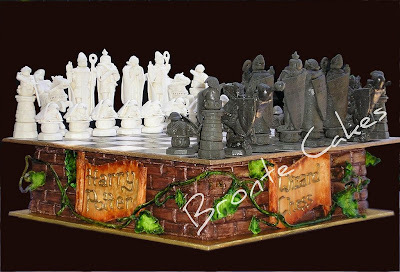 I would like to thank everyone on Cake Wrecks for featuring my HP chess set.... What an honour! It did take about 2 months to make all the pieces...but I work full time (in my other job) so I made them at night and during my lunch hour...any moment spare. 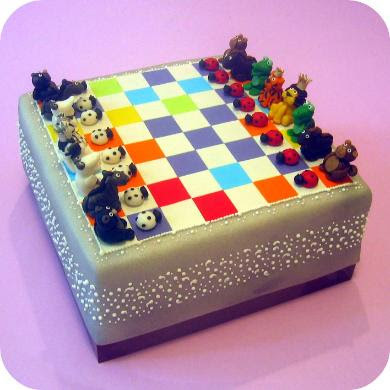 I have made a tutorial of how I did a chess pawn and posted on flickr and at Cake Central if anyone is interested in seeing how it was made...Thank you all again Bron H.
Mmmeliacakes did a Hungry Hungry Hippo cake! It shows one hippo, but it's definitely from HHH -- has the stretched out neck and everything! You can see it briefly on her Special Video on the blog. Oh my goodness, the CANDY LAND cake. *turns emerald green* I bet Duff and Co. had fun making that one. The Wizard's Chess--stunning. What would you do with those pieces afterward? I couldn't munch on one of those without a serious amount of guilt (or, no doubt, breaking off a tooth!). WV: Patessie: How a young French citizen talks about a bakery. "Patess'ie." That game of Life cake is perfect for an 80 year old! Love it. And the Taboo and chess cakes are amazing. The second cake down was a birthday cake for my friends Katie and Erin. It was super yummy in addition to being adorable! These are all great, but my favorite is the Candy Land cake. I love that game. It was my childhood favorite. That Game of Life cake is totally a wreck. All of the buildings are in the wrong place (Millionaire Acres halfway down the board? Ok...) and the path doesn't end; it connects back at the beginning. I'm sorry, did this suddenly become the Game of Reincarnation, or is everyone just supposed to go back to college after they retire? I just love all of them except that brown and green blobby cake and and "Operation" though very well done as a cake always creeped me out as a game ! I would have liked to see "Scrabble", "Twister", "Don't Break the Ice", "Hi Ho Cherrio" and "Chutes and Ladders" cakes too. Holy crow, these are amazing! Although, I can't say the same for those belly cakes on your last entry---those are grossly disturbing. Why haven't I thought of this? A Settlers of Catan cupcake cake would be awesome! Four lists on Board Game Geek featuring board game themed cakes, cupcakes, cookies, and in one case, a Pizza Settlers of Catan. Control panel from a computer that many programmers have fond (and not so fond) memories of. A Digital Equipment Corporation PDP-11/70. I love these board game cakes. My oldest son loves Chutes and Ladders - now that would make a really cute cake. I might just have to attempt that one. The Life Game, totally thought that was a Duff cake, and Charm City Cakes and "Ace of Cakes" guy are one in the same. He and his crew do awesome small work like those 2 cakes! Awesome! And I LOVE the chess cake! Our family loves to play Carcassonne, so we were excited to see it on your Sunday Sweets post. The city shapes are great! Thanks for a fun visit. Okay, I have to say the game cakes are cute. I love the dazzling colours on the candy-land cake. Oh, and the little ladybirds on the chess set! Did operation really have a butterfly in the tummy? That takes me back. My kid liked the game much. Though I don't find it interesting. I like some more challenging one.